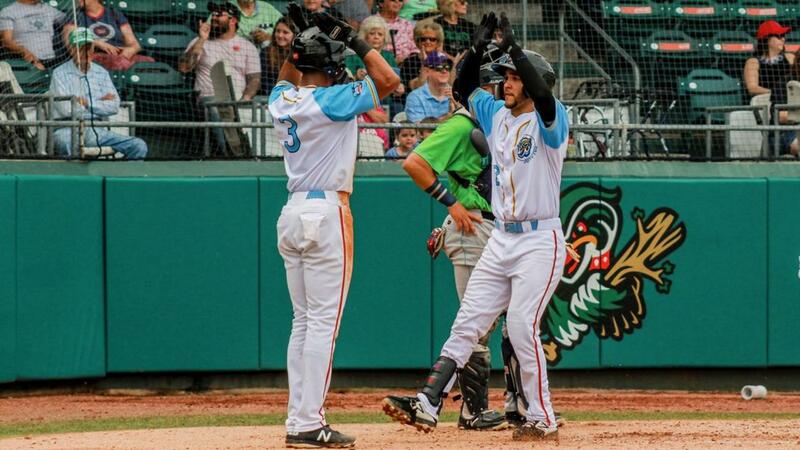 Kinston, N.C. - The Wood Ducks batted around in the third inning, and scored five times, on their way to an 8-0 shutout victory over the Hillcats, Sunday, to earn a series split. Diosbel Arias led off the third lining the first pitch from Hillcats (7-4) starter Justin Garza (loss, 1-2) off the wall in left field for a double. Yonny Hernandez then worked a walk two batters later, and then Bubba Thompson slapped a single to right field to drive in a run, and make it 1-0 Down East. Leody Taveras then dropped down a bunt single to plate a second run, his third bunt hit of the season. After Thompson was picked off second, Anderson Tejeda blasted a two-run homer to right-center, his first of the year to make it 4-0. Later in the inning, Yohel Pozo singled through the left side of the infield, plating Tyreque Reed , who doubled to right one batter prior, capping a five-run frame. Garza lasted 5.0 innings, giving up six runs on seven hits, he walked three, and struck out four, allowing six runs for the second straight start. For the Wood Ducks (7-4), Noah Bremer (win, 1-0) pitched five strong innings, allowing five hits, but no runs, he walked one, and struck out two, becoming the second Woodies starter to pick up a win this season. The Wood Ducks added a run in the fifth on a leadoff solo home run from Tejeda, who becomes the first player this season to go deep twice in a game. It was the second two-homer game of his career. Down East plated a pair of unearned runs in the eighth to expand the lead. Arias and Ryan Dorow reached on back-to-back singles to begin the inning, and two batters later, Thompson hit a swinging bunt up the third base line and reliever Anderson Polanco fired wide to first base, bringing in a pair of runs to make it 8-0. Francisco Villegas worked three scoreless innings out of the Wood Ducks pen striking out two, while Peter Fairbanks fired a perfect ninth, recording a strikeout, to seal the win. The Wood Ducks hit the road for a seven game trip beginning tomorrow night in Salem for a 7:05 p.m. start. Right hander Jason Bahr (0-0, 0.00) will take the hill for Down East, opposed by Salem righty Daniel Gonzalez (0-1, 476). The broadcast will begin at 6:50 p.m. on 960AM The Bull and online at 960thebull.com as well as on the MiLB First Pitch and TuneIn Radio Apps.